Dogtags make great stag party accessories! Perfect for keeping track of the boys on Stag night and ensuring the groom has a 'last fling before the ring'. 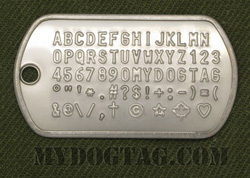 What happens at the stag party, stays a the stag party, but at least your dogtags will help you to remember your night of debauchery. 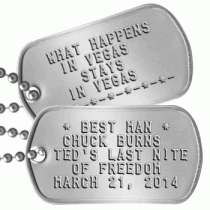 See more details about our Stag Night Dog Tags or Customize yours now! 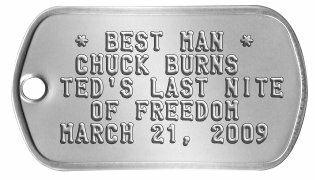 Give the groom a fighting chance by supplying him with Bachelor Mission dogtags. Make him 10 dogtags with 10 long neckchains and an assortment of silencer colors, each with a sexually charged dare or task on it. 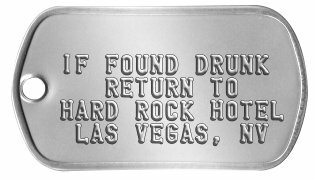 See more details about our Stag Night Task Dog Tags or Customize yours now! All orders are shipped within 1 business day and are usually delivered within 1 week (in North America). 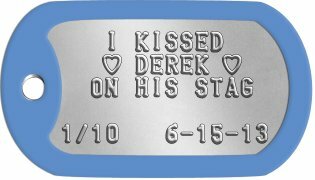 If you need any assistance creating or ordering your Stag Party Dog Tags please contact us directly, we are here to help!